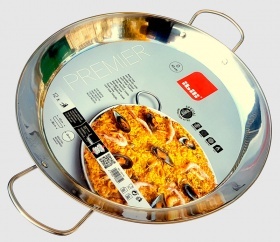 Garcima produce a range of top quality stainless steel paella pans under their "Guison" brand. 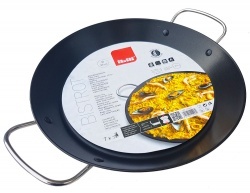 These pans are specifically designed for use on electric hobs & AGA hotplates. 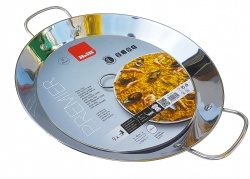 The base of a traditional paella pan is slightly curved making them unsuitable for use on electric hobs or Aga's. 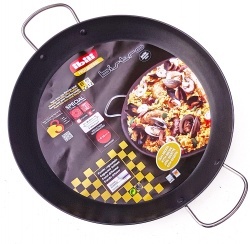 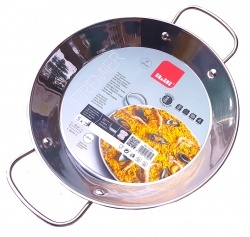 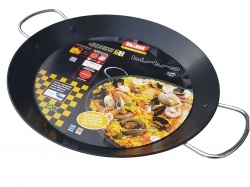 Their range of "Guison" Sandwich base paella pans have a machined base allowing the pan to sit flat on a hob. 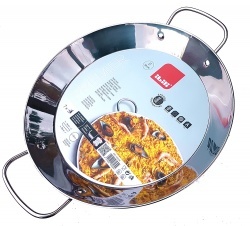 They are available in either stainless steel or with the additon of a non-stick coating. 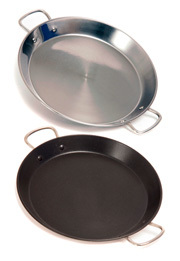 Each pan is measured from the top edge (excluding handles). 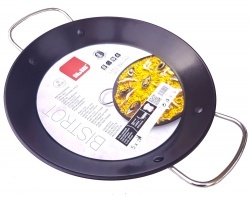 To help you select the correct size pan we have included keys with dimensions and the approximate number of servings for each individual pan - these can be found by clicking on the information for each pan.